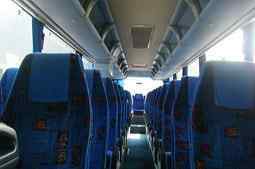 Tower Hamlets Minibus Hire provides coach and minibus hire in Tower Hamlets and the surrounding area. We are a long-established business and have built a reputation for quality and reliability among the local population. We have a dynamic team recruited for their friendly personalities and customer service skills and trained in every aspect of coach and minibus hire. They will go the extra mile to make sure that you get a really good deal and one that suits your budget. We never dispatch a vehicle unless we know that it will fully meet the customer’s expectations. We recruit our drivers from the local area. They have lots of experience of driving in and around London and know all the major routes on all points of the compass. We know that a good driver can make an enormous difference to any outing and we set our drivers high standards which, I am pleased to say, they meet. All our drivers are fully licenced and CRB checked. We receive many letters of thanks about our customer service agents and drivers. We only use vehicles under 6 years old made by major manufacturers. Our fleet includes Volvos, Ford Transits and a Mercedes 16 seater minibus. Groups greater than 16 people require a small coach. Our Iveco Coaches are superb vehicles, comfortable and fitted with GPS, Wi-Fi, and on-board music and DVD systems. 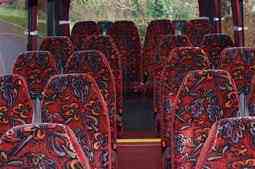 We can provide coaches for parties of 18 up to 72. Book a vehicle by completing the form on our Internet site and sending it back to us; you can’t do this with our competition. If you want to have a chat with one of our customer service agents or need some advice then please ring us, our booking line is open 24/7 and our customer service agent will be only too happy to help. Once we know your requirements we will send you a fully inclusive no obligation quote in 30 minutes. Sometimes the unexpected happens, one of our competitors lets you down or you discover your work team has to get to another party of the country pronto. Don’t panic, ring us and we will send a minibus to collect you in less than an hour. A minibus can be the cheapest way for small partied of holiday makers to get to the airport; there is plenty of luggage space too. Our driver will collect you from your home and drive you to the airport in plenty of time to catch your flight. On your return we will monitor your flight so that, if it is delayed, we will still have a minibus waiting to collect you when your flight arrives. Our coaches are the perfect touring vehicle, sit back in comfort and watch the world pass by though tinted windows. Wherever you want to go, Scotland, Ireland or even continental Europe, we can put together a touring itinerary for you. Our larger coaches are fitted with toilet facilities and we can, on request provide refreshments on board. 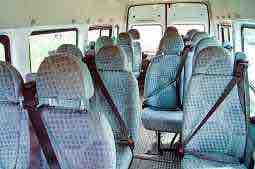 The advantages of the minibus. We think minibuses are a great way for small groups who wish to travel together to get around; compared to other forms of transport; they are very cost-effective too. Tower Hamlets is only 6 miles from Charing Cross, a minibus makes a night out in Central London both accessible and safe, with no need for people to travel on buses or the Underground late at night. Book a minibus to take you to one of the fabulous shows playing in the West End; Phantom of the Opera and Billy Elliott are both still on during 2016. If sport is your passion, take a trip to Wembley in one of our minibuses and see that cup final with your friends. If it is a day out for children, Southend-on Sea is only 37 miles away. The London Borough of Tower Hamlets in postcode area E1 has an ethnically diverse population of 284,000 with white British and Bangladeshi comprising around 30% of the it each. The borough covers most of the old East End including London Docklands, Bethnal Green, Whitechapel and Canary Wharf. Part of the Queen Elizabeth Olympic Park is also in Tower Hamlets. Much of the East End was heavily bombed during WW11 and the closure of the last East End Port of London Dock in 1980 heralded a period of regeneration. Today many global finance businesses have their headquarters in Tower Hamlets, including Barclay’s, Citygroup and Morgan Stanley. There are over 100 parks and green spaces in the borough which is also home to the V&A Children’s Museum and the Dockland’s Museum. The area is well served by the London Underground and the Dockland’s Light Railway. At Tower Hamlets Minibus Hire service, we are the ideal company to come to for minibus hire in Tower Hamlets Ditrict, and the wider area of East London. We have a superb fleet waiting to pick you up at your door, whenever you need us to, and we’ll transport you in roomy splendour to the destination of your choice. With Volvos, Mercedes 16 seaters and Ford Transits, we have vehicles to suit every occasion. Our Iveco coaches are available for transporting larger parties on tours, day trips and the wide range of events we provide transport for. We come recommended by our previous customers for our customer service and the professionalism of our team. All our vehicles are chauffeur driven, with our driver negotiating the traffic, parking up and making sure your journey is the best trip of the day. So, you can travel in luxury, with your own chauffeur, at any time of the day or night, and all at a very reasonable price. Call us today, and we’ll make sure you travel in comfort, just like you’ve never left your own armchair! We offer a comprehensive minibus hire service to provide you with the best vehicles, the best drivers, and at the best price. We’ll take you wherever you want to go: the airport, out on the town, hen parties, stag parties, day trips, tours, theatre visits, sporting events, music festivals, family celebrations and funerals too. Here in Tower Hamlets we are waiting to hear from you. Book on-line or call today, tell us how we can take you the extra mile! The London Borough of Tower Hamlets is located in the eastern part of London. As well as incorporating the redeveloped Docklands area, it also makes up the core of East End London. With an ethnically diverse population of almost 273,000 people, the borough is home to the British Bangladeshi Business and Residential Community. Brick Lane provides Europe’s largest range of Bengali restaurants and businesses. First mentioned in 1646, by the 19th Century, Tower Hamlets:the ‘East End’, had become seriously overcrowded, and an area of extreme poverty, criminality and disease. The early 20th Century saw efforts made by the council to address the overcrowding problems. The 1980’s saw regeneration at Docklands and Canary Wharf and 2012 saw the Queen Elizabeth Olympic Park built.